This holiday season, earn a $10 Coventry Cash Coupon for every $50 you spend (per single transaction) at participating locations. Promotion valid on select weekend dates throughout the holiday season. Look for the signs posted outside the parking garage on Coventry Road at the Coventry Village Holiday Ambassadors Station. Your valid day-of-receipts can be redeemed for Coventry Cash on select promotional dates between 12 PM - 6 PM at the Ambassadors Station. Please note, supplies are limited and while supplies last. 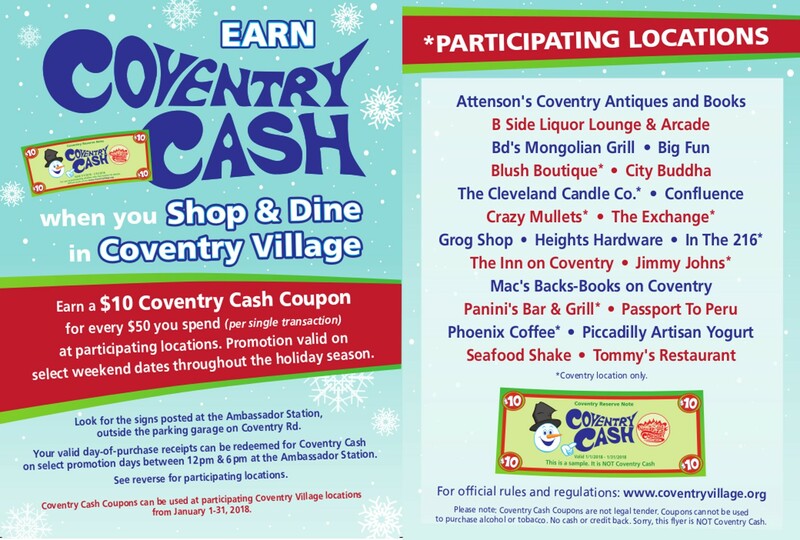 The Coventry Cash Coupons you earn, can be used at participating locations from January 1, 2018 through January 31, 2018. Click here for promotion rules and regulations.